We joined harvest hosts a month ago anticipating our first retirement getaway on Whidbey Island, Washington. 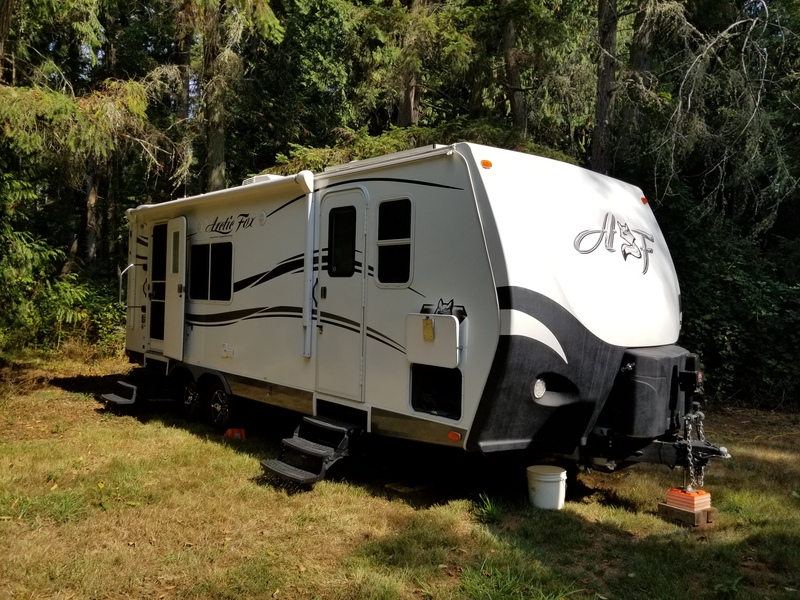 We contacted Steve and Bev at The Whidbey Island Distillery a week prior to our departure, asked if there was room for us to stay for 1 night and gave them our date of arrival. They were so friendly and accommodating, gave us specific directions on how to enter, where to park and advised us they even had water and electric for us. We sailed pretty good through Seattle heading for the ferry at Mukilteo, no problems, even being just under 50 feet long. The ferry ride was spectacular, 73 degree weather, mild wind and clear skies, couldn’t have been more perfect. The ferry landed in Clinton, Wa. smooth sailing and off we headed to The Whidbey Island Distillery for our first Harvest Host experience. Upon arrival, we hurried and secured our trailer so we could get to the distillery for a tour and tasting. Whidbey Island is beautiful in itself. Whidbey Island Distillery is warm and rustic, with award winning liqueurs. A fun and interesting tour with a very unique process with friendly and informative staff.. The liqueurs were amazing, with blackberry being our favorite. We thank our hosts for letting us stay in a beautiful, quiet and serene camp site. We will certainly pass on our special experience and definitely return.